Because prefab homes, modular homes and tiny home RVs are easily moveable, why not take them to places with the best scenery. That’s especially true for RV park model tiny homes, where all you have to do is hook them up to your truck (or extra powerful electric car, according to some funny internet pictures I saw recently), and drive them to where you want to be. This particular tiny house is a model by a company we found called Hope Cottage, and the model is tied to the place where it’s built: the Skagit Valley of Washington State (and British Columbia, where the Skagit river originates). Actually, it’s tied to a company that does bed and breakfasts, and they’re near La Conner, Washington, and people can go out to that natural environment and stay in a tiny house on wheels and try it out for themselves. For those not familiar with our part of the work, the northern West Coast offers all sorts of northern rain forest wildlife, all sorts of flowers in the summer, tall mountains of the Rockies, moderate climate wildlife like Killer Whales, sea lions, Snow Geese, swans, bears, cougars, deer and more. Back to the tiny home RV now, right? How big is it? It’s 170 square feet. 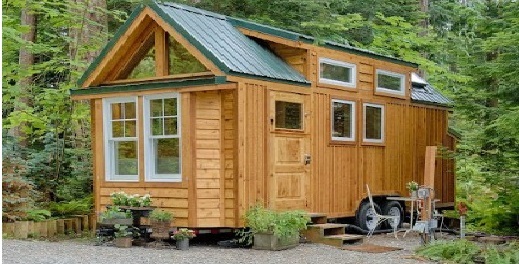 A tiny home, but this seems to be a somewhat popular size to build in for tiny homes. It still has enough room for a loft bedroom, a full bathroom, a kitchen and dining area and a living room, as well as something less common in a tiny home. This one has a sauna. To see more of Hope Island Cottage’s tiny home RV units, find them in the Building Homes and Living directory.